Elephants are massive, smart and herbivorous, making them a treasured animal species to millions of people around the world. 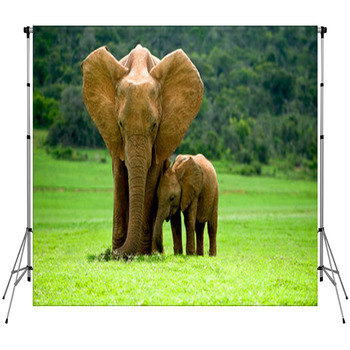 Give your photography clients the chance to feel close to these mighty animals with our elephant backdrops. 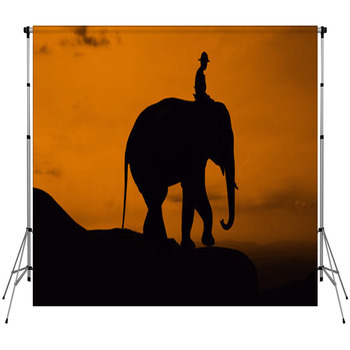 If you need a scenic photo backdrop to pose a family in front of, use our custom sized backdrop featuring the pure black silhouette of a baby African elephant following his mother. There is a huge tree with a gnarled trunk and leafless branches beside the elephants, and the sky behind them is glowing yellow, red and orange in the last moments of sunset. Another ideal photographer backdrop design for group shots displays a massive herd of elephants roaming across the dry grassy plains of Africa. Behind the herd, you can see a sprawling green tree, and beyond that is towering Mt. Kilimanjaro, with clouds hovering above its snowcapped peak. 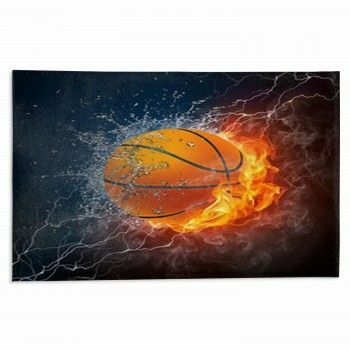 We also have photo backdrops perfect for pairing your client with a close up image of the animal they adore. Add a backdrop to your studio that shows the profile view of the enormous head, trunk, and shoulders of an Indian elephant set against a misty blue sky. For your photo subjects who want to demonstrate the precarious situation that humans have put elephants and the other great animals of the world into, use a backdrop that depicts an elephant and a rhino walking across a rope bridge hung between two rocky cliffs, representing the dangers these creatures face. There is also a tiger resting in the canyon below, and tumultuous gray clouds swirling overhead. When photographing little kids, make sure to use a custom elephant backdrop with a fun design, such as a simply drawn cartoon elephant decorated with reddish-brown flowers and hearts on its gray skin, while a little green bird sits on its head.